The First Cebu Blog Camp 2010: Blogging, Expressions and Opportunities, an event for bloggers to gather, network and socialize. Cebu Blog Camp also aims to help those interested people or newbie bloggers to not only meet other bloggers but also learn from them as well through sharing of their experiences and knowledge. The event will hopefully gather a large number of bloggers all over Cebu to discuss and share the latest developments on the Web, Blogging Platforms, Search engines, making money online, and the like. By educating bloggers and those interested to enter the world of blogging, we believe there can be a better future of the online community of Cebu. 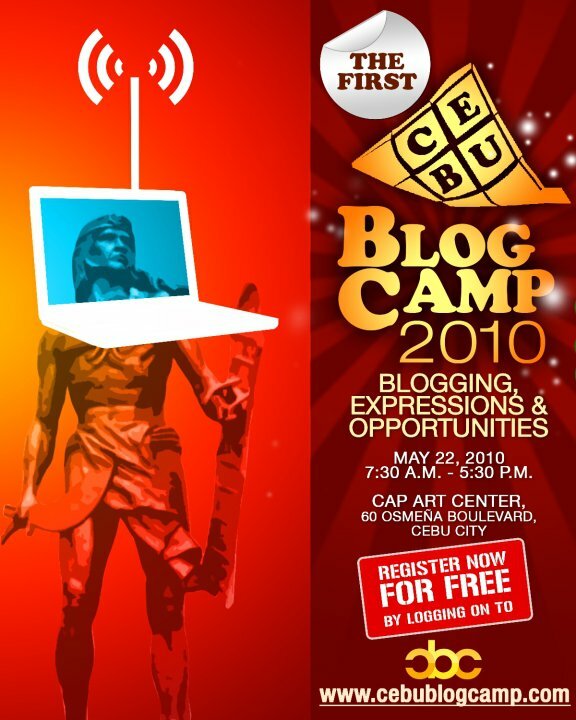 The Cebu Blog Camp 2010 is still open to interested participants and perhaps to sponsors. Once the Cebu Blog Camp 2010 program has been set by the organizers, I'll definitely be updating this post as well for you to know more about the Cebu Blog Camp 2010 this May. The registration to Cebu Blog Camp 2010 will start on April 5, 2010. Cebu Blog Camp 2010 admission is FREE but limited to 200 seats, only. The registration for Cebu Blog Camp will be first come first served only. The Cebu Blog Camp 2010 is open to all bloggers and non-bloggers from Cebu City and its neighboring cities and provinces who wish to learn the basics skills in amateur and professional blogging. The Cebu Blog Camp event is FREE. And to Register Click Cebu Blog Camp 2010. Cebu Blog Camp 2010 is an event organized by a group of Cebu Bloggers.